Phonak, one of the world’s leading hearing aid manufacturers, has just unveiled a new product that is creating quite a buzz in the hearing aid industry. Phonak has introduced its long-awaited Made For All (MFA) hearing aid, the Audeo B-Direct, which provides direct connectivity to any cell phone with Bluetooth® 4.2 wireless technology and most older Bluetooth® phones. With this release comes a new TV streamer accessory, TV Connector, and a new smartphone app to control the Audéo B-Direct hearing aids, Remote App. Finally, Phonak has extended their successful Belong platform to their entire custom lineup of hearing aids. Since Made for iPhone hearing aids first hit the market in early 2014, direct connectivity between hearing aids and smart phones has become one of the most sought after hearing aid features. In the 3+ years since that time, almost every major hearing aid manufacturer had released a Made for iPhone hearing aid, except for Phonak. That is, until now. The long-awaited product (at least according to press releases and marketing), will not disappoint and has exceeded expectations. Many thought Phonak was late to the game in releasing this product, choosing instead to focus on building a wildly successful lithium-ion rechargeable hearing aid, the Audéo BR. Perhaps Phonak was late to the “Made for iPhone” game, but in introducing this “Made For All” hearing aid, they are sure to recover any ground they may have lost to other manufacturers, and will now have others playing catch up. There are 2 things that really set the Audéo B-Direct aside from all other hearing aids on the market. Direct connectivity to any phone: Audéo B-Direct hearing aids can connect to iPhone, Android, and any other cell phone that utilizes Bluetooth® 4.2 wireless technology, which is the vast majority of smart phones on the market. But, the phone doesn’t even have to be a smart phone to work with the Audéo B-Direct, Phonak says most older Bluetooth® phones will be compatible as well, regardless of the brand or operating system. Hearing aids used as a wireless headset for hands-free calls: Audéo B-Direct hearing aids provide truly hands-free functionality just like a Bluetooth® wireless headset. This is something our customers have been asking for for a long time. You see, even with Made for iPhone hearing aids streaming a call through both hearing aids, the hearing aid wearer would still have to hold the phone to their ear (or at least the microphone to their mouth), so the other caller could hear them. That will no longer be necessary with Audéo B-Direct, as the hearing aid microphones are used to pick up the hearing aid wearer’s voice for phone calls- and the phone doesn’t have to be anywhere near the hearing aids. In fact, you can even answer a call with just a quick touch of a button on the hearing aid, and reject a call with a longer press and hold. Rumors of these units started swirling months ago, and in that time we’ve received numerous questions from our customers. After scouring the web, and with help from Phonak’s audiology department, we’ve provided answers to some of the most commonly asked questions below. When is the Audéo B-Direct hearing aid available? As of August 21, 2017 we are placing pre-orders for this hearing aid, and we expect Phonak to begin shipping them August 28th. Are Audéo B-Direct hearing aids rechargeable, and how is the battery life? Audéo B-Direct hearing aids are not rechargeable, they utilize a size 13 disposable zinc-air battery. We expect the battery life to be at least a week, though this will depend on the amount of streaming. Do Audéo B-Direct hearing aids stream sound to one hearing aid or both? Streaming of phone calls is monaural (through one hearing aid), as the other hearing aid acts as the microphone so you don’t have to hold the phone or have it nearby. Your hearing provider will help you determine which hearing aid (right or left) will stream the voice of the caller- this will depend on your preference and hearing loss. Music and TV will reportedly utilize binaural streaming (both ears). Are Audéo B-Direct hearing aids CROS/BiCROS compatible? They are not. How much do Audéo B-Direct hearing aids cost? Word is that most hearing centers are pricing Audéo B-Direct hearing aids the same as Audeo BR, and we are following suit. This hearing aid will be available in 3 technology levels, 90, 70, and 50. Our price for the Audéo B90-Direct hearing aid will be $2399, Audéo B70-Direct will be $1799, and Audéo B50-Direct will be $1399. How close does the phone have to be the Audéo B-Direct hearing aids to take a call through the hearing aids? We are told that as long as the phone is within 20 feet, you’ll be able to answer the phone with the hearing aid’s push button and can have a truly hands-free conversation. What accessories are compatible with Audéo B-Direct hearing aids? Because these hearing aids connect direct to phones, there isn’t really a need for accessories, finally! At this time, there is only a TV streamer accessory, called TV Connector (more on that below). If you have additional questions, please feel free to comment on this post and we’ll answer them as quickly as possible. Billed as a “plug and play” device, this USB-powered TV Connector streams audio within a range of 15 meters, effectively turning the hearing aids into wireless TV headphones. As soon as the TV Connector is powered on, it will automatically detect Audéo B-Direct hearing aids within a 1 meter radius, so there is no need for a complicated pairing process. A neat thing about this accessory is it will stream to all connected hearing aids simultaneously, ideal for multiple Audéo B-Direct hearing aid wearers watching TV together. The Phonak Remote app turns your smartphone into an advanced remote control for your Phonak hearing aids. Used in combination with Bluetooth®, it optimizes your Phonak hearing aid by providing more control and flexibility. Once installed, the easy-to-follow pairing wizard will help connect the app to the hearing aids. 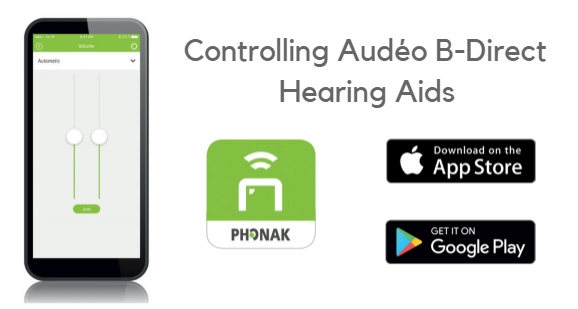 The Phonak Remote App will be available for free download in the Google Play Store and the App store in the coming days. According to the app’s user manual, users will be able to control the hearing aid volume, program, tinnitus noiser, and sound settings during streaming. This app isn’t as feature-rich as the apps available for Made for iPhone hearing aids, but keep in mind this is version 1.0, and the app looks to provide the most essential features most hearing aid wearers will need. With this release, Phonak has an incredible amount of momentum moving forward, and it seems the markets agree, with Sonova (SOON.VTX) on an tear as of late. Phonak has a lot of good things going for them right now. Their rechargeable hearing aid, Audéo BR, is flying off the shelves, as arguably the best rechargeable hearing aid on the market, and probably the most durable. Their recently released Virto B Titanium is a hit in the invisible and custom product category. Also, not mentioned in this post, Phonak has extended their successful Belong chip to all their custom products, and introduced a new custom CROS device (more on that in a later post). And now with a Made For All hearing aid, Phonak has a very dynamic portfolio with something for everyone. Why would you only stream the phone to only one of the hearing aids? This is plain silly. At least the Compilot streams to both aids. This is a huge deficiency and a deal breaker for me. Very disappointed! The sound streams to one hearing aid because the other ear is used as a microphone, which picks up your voice, so the hearing aids can truly be a wireless headset. The hearing provider will help determine which hearing aid should be programmed to hear the caller’s voice (the better ear). At first I was a little thrown by this, but the customers I’ve spoken to have been satisfied with it and are happy to not have to carry around the ComPilot anymore. I was told it didn’t stream any music or audio books etc that you may have on your phone. Is this correct? Are their plans to make available a rechargeable version of the Phonak Audeo B-Direct, as it seems to me with this current model they have made a significant error in not offering this hugely important development, as rechargeable aids are now becoming the product of choice in many different manufacturer’s hearing aids? How Long Does it Take to Get Used to Hearing Aids? Is it Safe to Buy Used Hearing Aids?